Works by two New Zealand artists, Sara Hughes and Peata Larkin will span a total of 5,760sqm once fully installed on the four external walls of the NZICC. Artwork from local artist Sara Hughes began installation this week. First to be fitted will be 98 glass fins that will adorn the western and eastern exterior, followed by the southern side of the NZICC where another glass artwork feature with over 500 panels of varying size will wrap the top level of the structure. “The artwork reflects the experience of walking through the New Zealand bush and looking up through a canopy of trees to see the unique light and colour of the forest,’’ says Ms Hughes. “In many ways we’ve been speaking ‘on behalf’ of the building over the last few years. 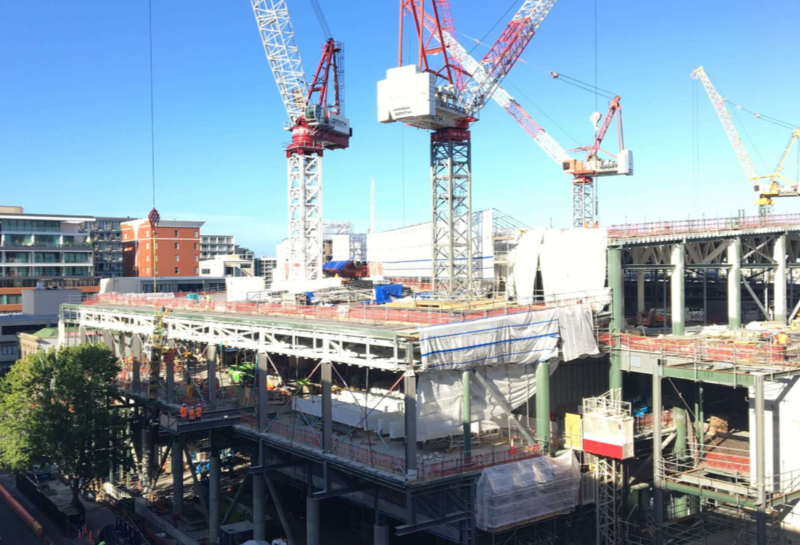 That’s why it’s so exciting to see the building increasingly start to speak for itself, and the installation of the first of the Sara Hughes-designed fins will see a powerful and distinctive part of the project’s identity assert itself on the skyline. 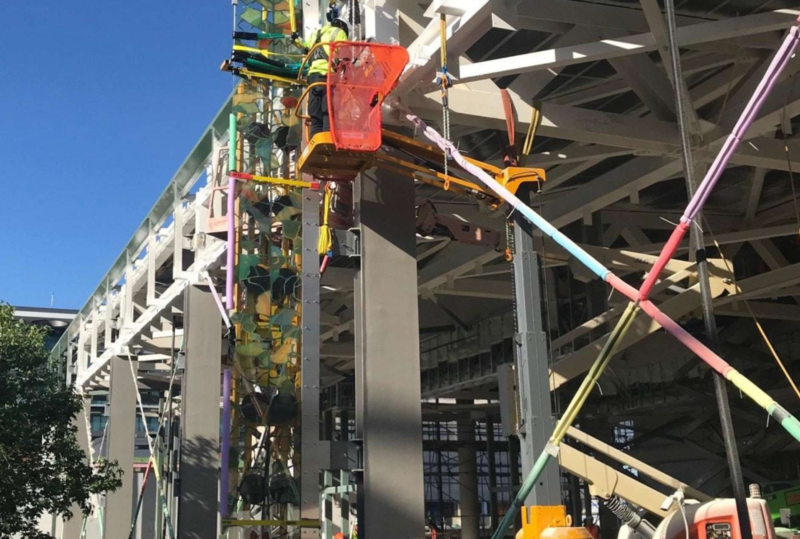 We’re looking forward to the first fins quickly weaving the larger veil of colour over these elevated and visible sections of the NZICC’s facade.” says Richard Archbold, Project Architect. Once Ms Hughes’ glass installation is completed, work will begin on the installation of Ms Larkin’s terracotta wall. The105m-long tile wall will span from Hobson Street to Nelson Street through the future laneway of the NZICC, and will wrap back into the building. The total size of both artworks is 5,760sqm. Sara Hughes’ glass artwork is 2,400sqm in total, and the glass artwork on Southern wall is overall 105m long and made up of panels 1.5m wide and between 1.2m to 3.67m tall. Click here to view the NZICC website. Sara Hughes is a dynamic artist with a career well established and highly regarded in Australasia. Based in Auckland she is known for her vibrant installations and public commissions. Her large scale artworks meld colour, pattern and light into architectural space in memorable ways. Hughes has exhibited widely and her paintings and installations are held in many important public and private collections including the Chartwell Collection, Auckland City Art Gallery, Te Papa, The Wallace Arts Trust, University of Auckland, Hocken Library and the Gallery of NSW in Sydney. Hughes has undertaken a number of high profile public commissions including the creation of a series of striking outdoor works for the re-opening of Cathedral Square in Christchurch.